New Central Agency on 112' 2006 Westport, SOUTHERN STAR! Bob Cury of RJC Yacht Sales is pleased to announce his Central Agency appointment of the 112’ 2006 Westport Raised Pilothouse MY, SOUTHERN STAR. 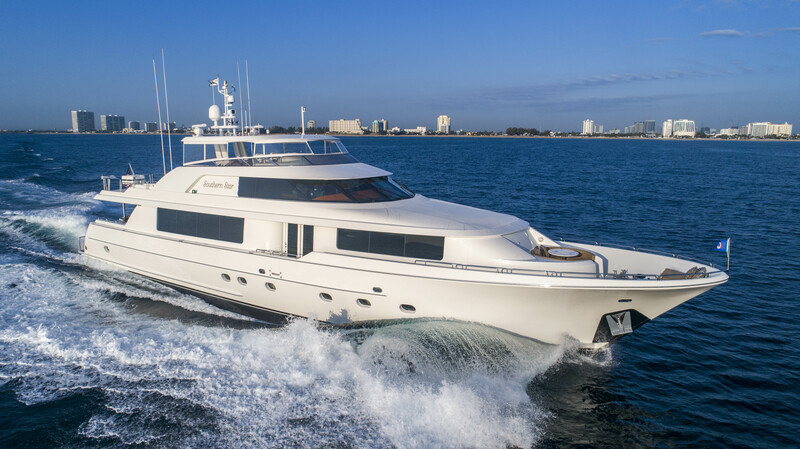 SOUTHERN STAR represents a highly customized 112' Westport which accommodates up to eight owners and guests in four en­suite staterooms along with crew quarters in three cabins below deck. Her interior is tastefully done with cherry joinery interior, spacious salon with formal dining area and gourmet style galley. The exterior spaces include large aft deck with teak dining table and wet bar along with a spacious flybridge with ample seating area, wet bar, BBQ, Jacuzzi with sunpad and boat deck for 15' Nautica tender. In June 2018, the vessel received a complete Awlgrip exterior paint job along with bottom paint, prop speed, cutlass bearings, new shaft seals, etc. Also in 2018, her interior was updated with new custom carpet, new appliances and Cambria stone countertops in galley. A new EZ2CY flybridge enclosure was installed along with Sea Tel HD Sat system, (2) A/C compressors & new exterior cushions throughout completed the refit. Powered by twin MTU 16V-2000’s with only 4700 original hours, she is equipped with all the large yacht options to include; twin Northern Lights 65KW generators, (2) 1400 GPD watermakers, Naiad stabilizers, bow thruster, etc. Learn more about SOUTHERN STAR & view her professional video here!